Mix all grains with dried fruit and cinnamon right the in crock pot. Stir in water and vanilla. Cover and cook 6 to 8 hours on low. Stir before serving and add more water if needed. Serve hot. 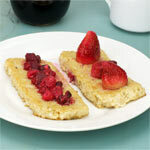 Topped with brown sugar, drizzled with maple syrup or your favorite fruit topping. Not only is it delicious and hearty, but it also promotes regularity. 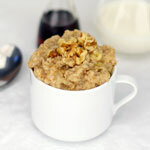 What do you think of Six Grain Crockpot Breakfast? I agree, this is the best hot cereal and wonderful reheated. As others suggested, I used 4 cups of water, skipped the fruit and spices (used the first time and didn't care for it) and at the end of the cooking time, I added 1/4 cup blend/coffee cream to make it more creamy. Wonderful healthy recipe. I too used quinoa in place of the cornmeal and steel cut oats for the oatmeal. Thanks for a great recipe. This recipe is not for me. Too mushy for my liking. I love this recipe. I've made this several times and could eat it all day! I love crockpot breakfast but now I have to be gluten-free. 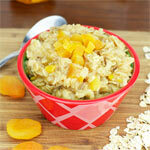 Very nice alternative to oatmeal and I love putting it in the crock pot overnight. I'm not a huge fan a lot of the grains, so I just balance the total with rice, steel cut oats and barley. Fruit of choice for me is dried cherries and peaches or apples but I like the tropical twist- I'm going to try it! I up the water to 4 cups too. 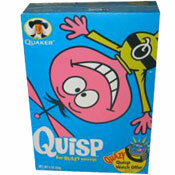 This is a great cereal! My substitutions: steel cut oats instead of rolled oats; quinoa instead of cornmeal; and 1 teaspoon cinnamon + � teaspoon nutmeg instead of all cinnamon. Dried pineapple was my fruit of choice and it�s wonderful. I used a 1.5 quart crock pot and it worked well. 8 hours was the perfect cooking time. I divided the cereal into 6 containers and have been taking one to work each day for breakfast. This recipe is easy, great tasting and good for you! Does it matter how big one's crock pot is? 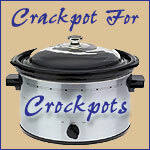 I only have a 6 Qt crock pot, which seems huge! The other day at the farmers market, a local restaurant was giving samples of a very similar recipe with an tropical twist. I tried it and: I LIKED IT ! I made these modifications to (the recipe above): Added 1/2 cup chopped crystalized ginger, cut the vanilla to 1/3 Tbsp, added 2/3 Tbsp coconut essence and a pinch of salt. Oh, I do start with 4 cups water. Hey, I LOVED this! But, I used steel cut oats. Why, with all those other whole grains, go for rolled oats? I put in, I think, about 3 Tbs steel cut. Skipped the dried fruit because there's so much fresh to put on top right now. I used a 5 qt. crock, which was a bit big but worked. 3 cups of water wasn't enough. I had to add about 2 more in the morning, but stirred it all up and had a wonderful bowl with big nectarine chunks and a splash of sugar-free maple syrup. Best hot multi-grain cereal I've ever had, and what a bargain!